Valid as of the study year 2017/18: To support third-country nationals, i.e., non-EU, non-EEA, and non-CH nationals, living in Germany and studying in any of the FH Kufstein Tirol degree programs, the FH Kufstein Tirol offers, for the duration of their whole study, a special scholarship limiting their tuition fees per semester to € 363.36. 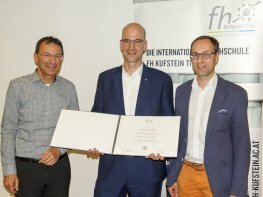 With this scholarship, the FH Kufstein Tirol, an international university, supports migrants living in Germany and belonging to one of the two groups of people listed below. 1. Individuals themselves or an individual to whom they are a dependent (a parent or spouse) who have had their main place of residence in Germany for a minimum of five consecutive years immediately prior to applying for a degree course at the FH Kufstein Tirol for the first time. Proof: Confirmation of insurance coverage (= Mitgliedsbescheinigung) proving that the study applicant has paid National Insurance contributions throughout the last five consecutive years and a confirmation of registration proving the place of residence throughout the last five years. These two documents need to be submitted prior to the application for reducing the tuition fee. 2. People who can legally live in Germany according to the asylum law. Proof: Proof of refugee status(Bescheid/Ausweis) in accordance with the Geneva Convention, or proof of right of residence (Aufenthaltsberechtigungskarte). All third-country applicants (including the ones entitled to the special scholarship) have to pay a tuition deposit of € 100 when applying for a degree course online. For details, go to http://www.fh-kufstein.ac.at/eng/Apply/Tuition-fee.